Figure 1. Hematopoietic System of Bone Marrow. Hemopoiesis is the proliferation and differentiation of the formed elements of blood. Watch this video to see doctors discuss the dangers of blood doping in sports. 1. 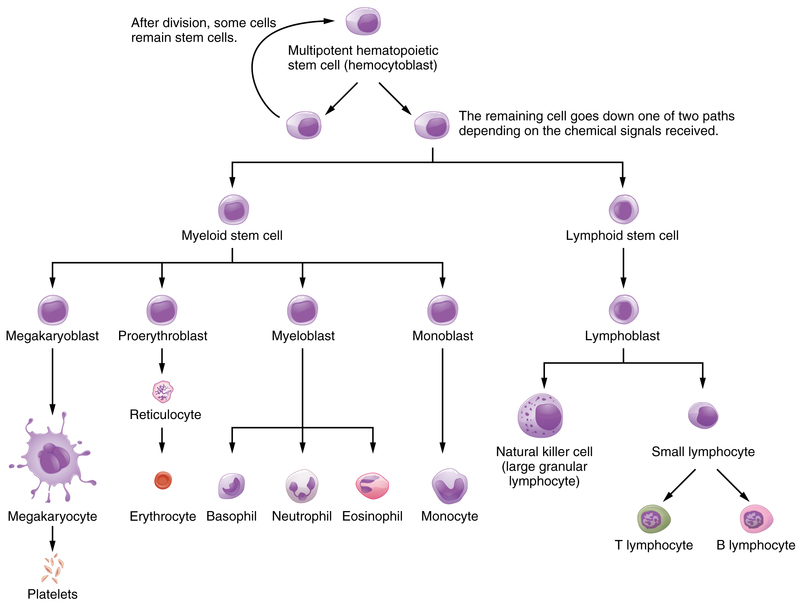 Which of the formed elements arise from myeloid stem cells? 2. Which of the following statements about erythropoietin is true? 3. Interleukins are associated primarily with which of the following? 1. Myelofibrosis is a disorder in which inflammation and scar tissue formation in the bone marrow impair hemopoiesis. One sign is an enlarged spleen. Why? 2. Would you expect a patient with a form of cancer called acute myelogenous leukemia to experience impaired production of erythrocytes, or impaired production of lymphocytes? Explain your choice. 18.2 Production of the Formed Elements by Rice University is licensed under a Creative Commons Attribution 4.0 International License, except where otherwise noted.